Requiring buyers of alcohol to have a permit, even in major centres such as Alice Springs; making sellers of alcohol share liability for accidents or crimes in which grog is a factor; and motivating Indigenous communities to divert already existing government funding towards reduction of harmful drinking. These are among measures called for by the two-day Aboriginal grog summit that ended in Alice Springs today, according to Priscilla Collins, CEO of the North Australian Aboriginal Justice Agency (pictured at the summit this morning). “Our mob know there is a problem, and they actually want to fix it themselves, rather than governments putting in legislation,” says the former Alice Springs film maker who now lives in Darwin. 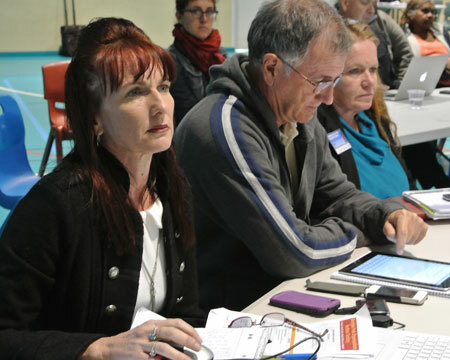 She spoke with Alice Springs News Online editor ERWIN CHLANDA. NEWS: How would you fix the problem? COLLINS: Getting rid of cheap grog, re-instating the banned drinkers’ register. Even some of the outlets have acknowledged the register had worked. One alcohol take-away free day a week tied to Centrelink payments – back to the old Thirsty Thursdays. Some of the alcoholics will find ways of getting a drink but we have to make a start to focus and change their ways. Banning alcohol sponsorship and advertising in sport is another one. NEWS: What role should the sellers have? COLLINS: They should be taking some of this responsibility, for example, abiding by the licensing conditions. People are actually dying coming out of licensed premises after being sold alcohol while being highly intoxicated. NEWS: It’s against the law to sell alcohol to an intoxicated person. Is enforcement adequate? COLLINS: No, it’s not. And that’s our biggest concern. It’s just disgusting. There was an incident where a man had died at the hand of the bouncers. And the pub continued selling alcohol through the back door while the police were investigating at the front. This is what we’re talking about. It’s all about dollar signs. If you want to make money out of it, well, you’ll need to take responsibility for some of the violence. NEWS: How would it work? COLLINS: A shop liability act has been suggested. If an incident such as violence, a big fight, for example, happens after someone who was drunk has purchased alcohol from an outlet, that outlet has responsibility and liability. NEWS: How would a permit system work? COLLINS: They have it in Nhulunbuy and Groote Eylandt and it works there. To buy take-away everybody has to have a permit. I think it’s applied for through the police. If you have a criminal record, a domestic violence order, and so on, you won’t get the permit. NEWS: Should that scheme apply in Alice Springs as well? COLLINS: I reckon it could. Alice Springs might be a little bit big, but look, it really works well in Nhulunbuy and Groote. It’s about responsible drinking. NEWS: Should it be introduced to Alice Springs? COLLINS: I reckon it should. When you look at the violence that comes out of alcohol, people before the criminal justice system, hospitals – you’ve got to try these things. COLLINS: There would need to be something to accommodate them. NEWS: What else came up in the summit? COLLINS: Housing, lack of education, violence in the communities – there are reasons why people drink alcohol, to make fade away what’s happening in their lives. The many Aboriginal organisations could provide help. Every community has its own issues. You can’t have a blanket approach. There is overcrowding, unemployment. NEWS: Should the taxpayer pay for this or should the communities act in their own right? COLLINS: I think the communities can have their own initiatives. There is a lot of money going out there under Stronger Futures – that’s 10 years worth of funding, Territory Towns, the Growth Towns – they have implementation plans in these communities and these should be taken into account. It’s not new money we’re asking for. NEWS: What difference to the alcohol problem would more widespread employment make? COLLINS: If someone has a job they are not drinking all day. They are working all day. They are able to support their family. The problem we have, in a many remote communities, we have a lot of non-indigenous people, not locals, getting the jobs, in the shires, essential services, education, Centrelink, health clinics. NEWS: Why are these positions not filled by Indigenous people? COLLINS: That’s a question for the communities. When I went to Santa Teresa I was absolutely beside myself. I have not seen an Aboriginal person driving that truck, working in that shop. What the hell is going on there? Who is making these decisions? NEWS: Is it perhaps up to Centrelink to say, take that job, no more dole? COLLINS: I think that the governments paying for services have to bring in identified Aboriginal positions and support our mob. NEWS: Are there willing job applicants – isn’t that often the question? Do Aboriginal people apply? COLLINS: We need to encourage our mob to apply, but sometimes when you put ‘Aboriginal’ on your application you don’t even get an interview. It happened to me. Clearly at least 431 people require a longer period of time in prison or under parole release whilst they maintain themselves in a detox program. Prison needs NOT be regarded as a social club or home away from home. Releases from prison, even sentences where possible should avoid prison, first being paroles, or restrictive paroles, either into own home or an approved leased fixed address, with regular testing (drugs or alcohol) and checking they there and compliant with various conditions. Compliance needed to reduce restrictions. Agree residents in rural and remote communities wishing to have a drink occasionally means we need end purportedly “dry communities” based on behavior of the few, enabling blockage of alcohol permits without solid reasons. Agree with cutting trading hours for service of alcohol to more reasonable, though first need discussion and agreement on what is reasonable. Agree need allow service of alcohol outside conventional hours where exists adequate numbers of clients needing unconventional hours as work during conventional hours. Disagree need take-away outside conventional hours believing IF desire to drink so great then learn to purchase (have delivered) during conventional hours. Believe most object to idea of 24/7 constant availability of take-away alcohol, due harm to wider community, particularly sub-sections our community, while almost all object to prohibition. There is a growing movement in Melbourne wanting to cut the trading hours of pubs, clubs and nightclubs. There seems to be an acceptance that the almost constant availability of alcohol is not good for the general community. But the alcohol lobby / industry has a real stranglehold on the NT Government and therefore nothing will change, regardless how many people die. In sociology, the concept of take-away alcohol is relatively new, especially in its modern state of seven days per week and relative to population density. When this is factored into the Alice Springs community, postmodern theory suggests that it be analysed as to whether it has a positive or negative outcome, but anybody can arrive at the answer simply by walking around the town. That leaves political myopia, alliance with the alcohol industry and social masochism as reasons for its ongoing existence. Hello NTG. Have a nice day. When you add the 1000 prisoners and the 2500 people on BDR, that gives us around 11,500 individual people apprehended or in prison for excessive drinking or alcohol-related offences during 2011/2012. (The actual figure may be a little less or more, as I have not factored in the turnover in prisoners, who average much less than 12 months incarceration; but some of these prisoners would also overlap the PCs and BDR numbers, due to their drinking activities before and after their incarceration, so all up the 11,500 figure probably stands up pretty well as an “educated guess”). Paul (Posted August 8, 2013 at 3:45 pm): around 2,500 people were placed on the BDR in just 14 months; and more than 80% of the NT’s thousand or so prisoners are said to have been affected by alcohol at the time of committing their crimes. @ Paul Parker. We’ve been trawling the numbers long enough. I’ve just witnessed the total disaster that take-away alcohol is in Central Australia, again today. There are people who were once so talented that they could have taken on the world in many fields, fashion design being one that readily comes to mind for the victim I’ve just walked away from, but today, they humbug for another can and it’s mostly forthcoming because the Aboriginal giver realises the situation is out of their control … just give the can and keep moving. The fact that the NTG allows seven day a week take-away and has AMT as its policy is just ridiculous. The cost in productivity, talent, lives wasted, lack of self esteem, disease, trauma, death, family wreckage and tax dollars spent, while organisations who claim to have an interest in Central Australia remain warming the seats of their office is a tragic farce that parallels ancient Greek tragedy. The black humour (no pun intended) is lost on the warped nature of our combined failure to reduce the supply in any number of inexpensive, practical ways. Before considering alcohol permits, do not provide how many arrests or detentions occur. Do provide how many separate persons actually came to attention, were arrested, charged, actually convicted, for various acts of violence, other crimes, with the % of these involving intoxication. Recoverable numbers need be published, or is it the same offender every time? In reply to Megg (Posted August 7, 2013 at 6:37 pm): I suspect that there are other important factors at play in the differences between the drunken behaviours of Aboriginal and Italian men. The high level usage of violence present in the social interactions of many Aboriginal people is one obvious difference. The importance of several behavioural inhibitors in everyday Italian culture is another. Alcohol is a highly valued source of disinhibition and empowerment for many Aboriginal drinkers. I don’t think there is much evidence that most non-drinking Aboriginal women (or other people) are in a position to moderate the behaviour of most of their male relatives, partners or friends when they are drunk, particularly at a boundary drinking camp. In fact, there is quite a lot of evidence to the contrary. Re handing out “free tappas in … bars to both minimise grog’s negative effects and to ensure that non-drinkers and drinkers can socialise together enabling the former to exert a beneficial influence on the latter”: one of our Alice Springs animal bars (at the Gap View Hotel) has long served “free” bread and snags to its patrons. I suspect that ceasing much of the take-away alcohol sales, and ensuring that bars don’t keep serving patrons after their blood-alcohol content has reached a certain level, would be more practical methods for ensuring that drinkers are better behaved. Even more practical would be a system of issuing licencing of everybody interested in drinking alcohol, with suspensions for committing acts of violence and other crimes while drunk; or simply bringing back the BDR, with ID scanning. I’m wondering if it’s possible to include the culture of consumption in this conversation as per Maggie Brady’s research? As I understand it, the highest cause of death amongst Italian men is from cirrhosis of the liver caused by drinking too much alcohol. Despite this there is very little grog associated anti-social behaviour in Italy. This is because in Italy it is considered inappropriate to drink without also eating, minimising grog’s anti-social behavioural impacts. There is a drink for every time of the day. It is consumed with the appropriate food. In this non-drinkers (in Italy the non-drinkers are usually women, I suspect but do not know if this is true in CA) are not separated from the drinkers. Instead they live side by side drinkers and as such are able to moderate the worst drinking behaviours like e.g. those terrible times when drinkers on the boundaries of community goad other drinkers into self destruction. It makes sense to me that the presence of sober people to counteract such grog based delusions would prevent these things from happening. I also suspect, though don’t know for sure, that the Spanish hand out free tappas in their bars to both minimise grog’s negative effects and to ensure that non-drinkers and drinkers can socialise together enabling the former to exert a beneficial influence on the latter. I’m not entirely sure how this transforms into policy but a good start would be to insist that the town’s “animal bars” start serving free tappas as a condition of keeping their licenses and we run advertising campaigns that link drinks to food. Crazy? Maybe. But it might be worth a try. Re-start quick identity checks to ensure buyers are not on the banned list? The idea of a license to buy take away liquor has been proposed already over 10 years ago and deserves some serious consideration. The notion that the purchasing of liquor is a privilege and not a right does not discriminate against anyone if basic rules are implemented. If your consumption of liquor gets you in trouble with the law, you have been violent, intoxicated in public or supplied grog illegally in the past or you’re on the dole you should not be in the possession of a license to buy alcohol. As for the enforcement of existing laws in regards to liquor outlets – it’s simply a disgrace. A few businesses make a killing selling it, flaunting the law on a daily base with the authorities mainly turning a blind eye and a vast majority pays for the inevitable consequences from it. The purchasing and consumption of alcohol should be legal to any adult (over 21 in my opinion)as long as they contribute to society (taxpayers and the like)and they do not cause harm or nuisance to themselves, family or the public (and the public’s purse). Banning the sponsorship and advertising of alcohol should be a no-brainer. The harm done by it far out-weighs the benefits in costs to the public. What an absolute oxymoron – the alcohol and sport “partnership”. We all know that we Aussies love a drink or two. But we also know (or should know at least) how much of our tax payers’ money it burns up to deal with the the consequences of it. But let’s not be kidding. Show me the politician with the balls to push that agenda with a “Coldie” in his hand and the donations from the liquor industry in his pockets! So we’ll keep complaining about the crimes and associated cost to the public and proudly point to our rights to drink and blame the individual drunk and be part of the problem and not the solution. Cheers to that! Before Priscilla Collins further laments the low rate of indigenous employment I suggest she returns to communities and speaks to the agencies that go out of their way to employ local staff. The responses she’ll get will be along the following lines: there are very few people who actually look for work; of those who do have a job there are a few very good workers and the rest in employment are time wasters and/or have no initiative and/or use any excuse not to come to work. Agencies on communities will all have their share of these “workers”. And they’ll probably keep them on the books because it’s so difficult to find others. And even if they do find others they’re likely to be as poor or worse than the person they’ve replaced. So don’t blame the agencies for having reliable workers (of any colour, culture) on their books. Look at those who can’t be bothered to work and who, because of the way the welfare system works in practice, don’t have to be bothered to find paid employment even when it’s available. There’s a parallel with the grog matter. There’s cheap grog available, sure. But if that was the only necessary and sufficient condition / cause underlying the grog problem we’d all be hopeless drunks. The problem lies with the people who choose to spend their money on grog and then have the time to sit around and drink ’til they cause problems. Despite all the measures in place to reduce the problem, those who really want to get grog will find ways to do so. Those who want to avoid work will also find ways to do so. System changes are necessary but need to be accompanied by changes in the heads and hearts of those who are neglecting their families and wasting their lives. Hear hear Arthur. What a load of rubbish this anti- grog brigade peddle! Again the blame is removed from the individual and another scapegoat is sought. Disappointing, as usual. Tired of hearing the same old race card excuse for unemployment. Everyone has the same opportunity to apply for a job – if you have chosen to not study or work and increase your skill level – why should you be chosen over someone who has? I don’t understand why anyone is asked to identify as indigenous or not on job applications. It shouldn’t be a consideration. How about bring back the Banned Drinkers Register but additionally add that you have to provide evidence of employment? I can’t see anyone with a job complaining about that! (S)He has a point. If the Aboriginal organisations in Alice Springs, and not just Lhere Atepe, want to be taken seriously when they speak to the issue of the harm done to indigenous Territorians by excessive grog consumption, then they really do want to consider getting out of the retail end of the business. Any defensive argument along the lines of “but someone else will just do it” is bogus. If you don’t want it out there, don’t put it out there. Too easy, and so much less hypocritical. @ Arthur Bell. Posted August 1. As someone who has posted occasionally during the eighteen months of this debate, it would be more helpful if you would explain what you’re on about. In Alice Springs there are three IGAs that are Aboriginal owned. Yes Aboriginal owned! Lhere Atepe Enterprise owns the IGAs. Three of them are trouble spots concerning Aboriginal people, where there is always some sort of Police activity. This activity is turned into a policing problem which then requires a service by CAALAS (Central Australian Aboriginal Legal Aid Service) to represent the Aboriginal person. This is where it starts get tricky. The same person who is the Chairman of Lhere Atepe Enterprise which owns the IGAs, is the same person who is the CEO/Director of CAALAS, which represents Aboriginal people in court. On one hand I am a Chairman of a grog selling outlet that encourage criminal activity by Aboriginal people, then the person will get in trouble with the law purchased from the IGA and my staff where I am the boss will defend you in court. Very confusing yes!!! So I really think that the IGAs better start being part of the solution. Must the legal system now consider everyone guilty until they prove their innocence? Why else expect community to accept and consider requirement for all buyers of alcohol to obtain a permit? Or is this the plan to just turn everyone into illegal drinkers so as to encourage corruption? What are latest figures for actual % of adult population taken into custody/care, actually charged to appear in court, each year for intoxication involved offenses? Overstating repeat appearances by same people indicates failure to deal appropriately with the repeat appearance persons so as to discourage inappropriate repeated behavior. The issue concerning what needs be done with repeatedly handled individuals is a different issue. IMHO everyone who labels a position as to be filled by “Indigenous” persons is a racist who degrades both the positions and anyone in them. I suppose you somehow have to “justify” your wage. But is this “Crap” all you have to offer!? The Same Old, Same Old Same Old! It is “You” and people like “You”, that are part of, if not, “the problem”.